I always wondered what it is with these wrought iron forms perched on poles that you find on sidewalks in some residential neighborhoods in Buenos Aires. Some of them are empty while others are filled with plastic bags and plastic water bottles. Then I realized they are garbage collectors. But why do Porteños put their trash baskets on poles? Well, there are several good reasons to put them up. Main reason: animals! Elevating the garbage baskets above ground is rat, cat, and most importantly dog-proof. There are so many hungry stray dogs that would otherwise spread the rubbish. Another reason to keep garbage off the ground is the heavy rain that occasionally floods the streets. Last but not least, a reason might be also that these baskets make it easy to spot recyclables, such as cardboard, paper, cans and bottles. 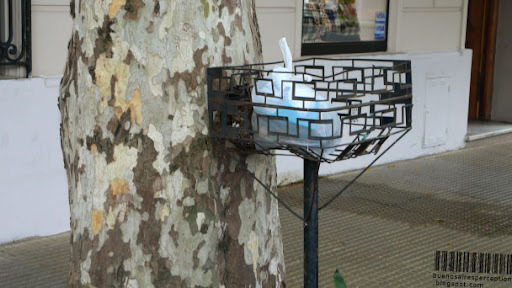 There are thousands of trash pickers in Buenos Aires that make a living of what others dispose. From your description, these trash receptacles serve several worthwhile purposes! Way to go! I think other cities might consider something similar! That has to be the coolest trash can I've ever seen! I would like to have the plastic bag concession in your city. I like the idea of the recyclables. I still have not worked out what the instructions were to avoid dengue-carrying insects on your cemetery-worker photo. Does that fit in here somewhere? You will find the dengue information on the cemetery-worker post. Sounds like a very good system to me since the wealthy will always be wasteful and the poor will find ways to be thrifty. Buenos Aires Photoblog: Thanks for the explanation. Buenos Aires often looks like a European city. It is the things that make it different, such as dengue-fever posters, that always catch my eye.